Borehole video by Kathy Kasic, SALSA Education & Outreach. Gravity Corer: The Gravity Corer is the largest tool in SALSA’s lineup, standing at about 30 feet tall and is capable of retrieving 20-foot cores. 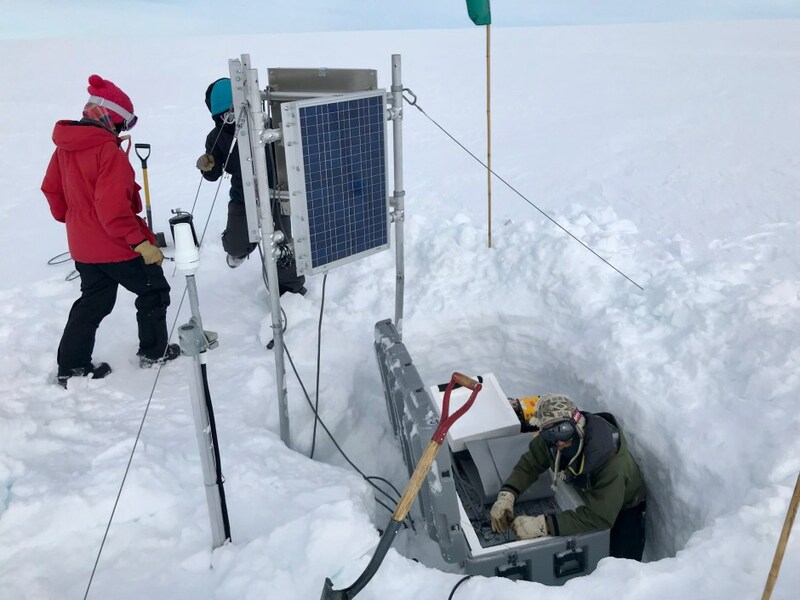 A Gravity Corer has never been used in a subglacial lake and even with three years of planning and prepping, the SALSA team had to learn and adapt during the sampling process. After many hours re-rigging the LARS (Launch and Recovery System) deck, the team sent down the first Gravity Core. As it pulled up from the bottom, the team noticed its weight dropped, indicating that whatever sediment it collected may have dropped out its coring tube. When the core returned to the surface, the team were anxious to see if it worked, but they found that the tube was empty besides water and sediment residue due to damaged sediment catchers. The Sediment Team were disappointed but quickly began planning for how to adjust the engineering and approach for the next round of sampling. Brad Rosenheim and Al Gagnon with the gravity corer. Photo by Kathy Kasic, SALSA Education & Outreach. Clump Weight: Next, the camera-equipped Deep SCINI Clump Weight was used to inspect the borehole. The Clump Weight’s live video feed discovered that the ice-water interface located roughly 300 feet down the borehole was frozen. The Instrument was pulled up and down until it broke through the ice and continued to descend into the lake. Once in the lake, the device captured more footage of the lake floor. After the instrument was brought back to the ice surface, the Drill Team used the hot water drill to melt the frozen ice-water interface to provide more time for science operations. Viewing clump weight live images of borehole and Mercer Subglacial Lake. Photo by Kathy Kasic, SALSA Education & Outreach. Filter Pump and Niskins: Once the Drillers finished melting the ice-water interface, the team deployed another filter pump to collect particles from the water column as well as a 10L Niskin bottle.